Ht / Wt: 6'3" / 218 lb. 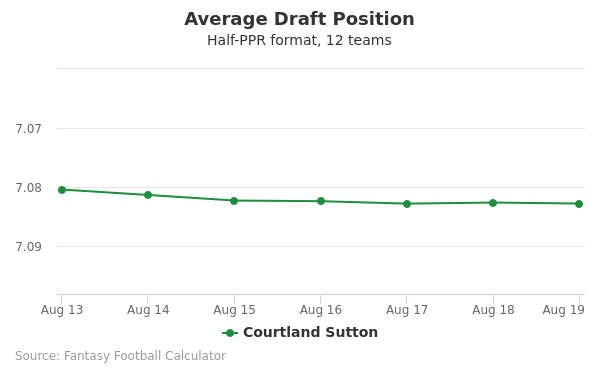 Courtland Sutton's fantasy value is measured by his average draft position (ADP) in fantasy football mock drafts. 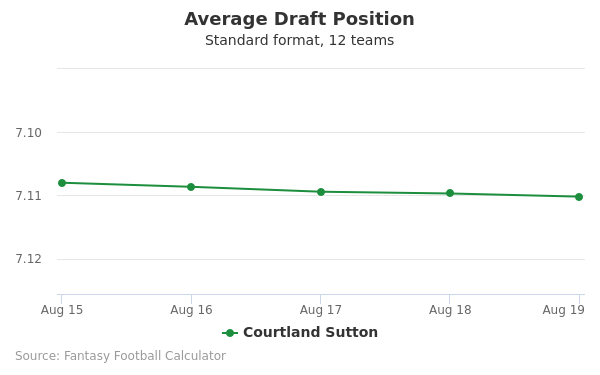 In recent drafts, Sutton's current ADP is 9.04, which indicates that his fantasy outlook is to be the 4th pick of the 9th round, and 100th selection overall. 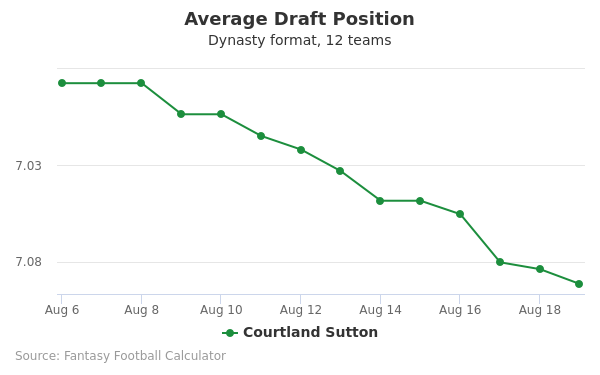 The code below will display a graph that updates every day to show the ADP data for Courtland Sutton for the past 30 days in 12-team PPR leagues. Draft Courtland Sutton or DeSean Jackson? Draft Courtland Sutton or DK Metcalf? Draft Austin Ekeler or Courtland Sutton? Draft Courtland Sutton or LA Rams Defense? Draft Courtland Sutton or Sterling Shepard? Draft Courtland Sutton or Jameis Winston? Draft Courtland Sutton or Tom Brady? Draft Courtland Sutton or Golden Tate? Draft Courtland Sutton or Gus Edwards? Draft Courtland Sutton or Matt Breida? Draft Adrian Peterson or Courtland Sutton? Draft Courtland Sutton or Trey Burton? Draft Courtland Sutton or Devin Funchess? Draft Baltimore Defense or Courtland Sutton? Draft Courtland Sutton or Dion Lewis? Draft Courtland Sutton or Jimmy Garoppolo? Draft Courtland Sutton or Donta Foreman? Draft Courtland Sutton or Marquise Goodwin? Draft Courtland Sutton or Kirk Cousins? Draft Ben Roethlisberger or Courtland Sutton? Draft Courtland Sutton or Larry Fitzgerald? Draft Courtland Sutton or LA Chargers Defense? Draft Courtland Sutton or Jacksonville Defense? Draft Courtland Sutton or Delanie Walker? 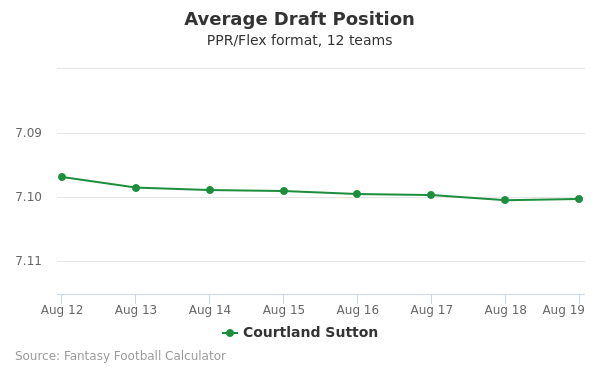 Draft Courtland Sutton or Lamar Jackson? Start Courtland Sutton or DeSean Jackson? Start Courtland Sutton or DK Metcalf? Start Austin Ekeler or Courtland Sutton? Start Courtland Sutton or LA Rams Defense? Start Courtland Sutton or Sterling Shepard? Start Courtland Sutton or Jameis Winston? Start Courtland Sutton or Tom Brady? Start Courtland Sutton or Golden Tate? Start Courtland Sutton or Gus Edwards? Start Courtland Sutton or Matt Breida? Start Adrian Peterson or Courtland Sutton? Start Courtland Sutton or Trey Burton? Start Courtland Sutton or Devin Funchess? Start Baltimore Defense or Courtland Sutton? Start Courtland Sutton or Dion Lewis? Start Courtland Sutton or Jimmy Garoppolo? Start Courtland Sutton or Donta Foreman? Start Courtland Sutton or Marquise Goodwin? Start Courtland Sutton or Kirk Cousins? Start Ben Roethlisberger or Courtland Sutton? Start Courtland Sutton or Larry Fitzgerald? Start Courtland Sutton or LA Chargers Defense? Start Courtland Sutton or Jacksonville Defense? Start Courtland Sutton or Delanie Walker? Start Courtland Sutton or Lamar Jackson?